It is a little bit late for the EU to remember international law on its Western border when it was ignoring it on its Eastern border, Marko Gasic, an international affairs commentator, told RT. Catalonia's leader has vowed to declare the region's independence from Spain in the coming days. Carles Puigdemont, the breakaway region’s president, said he does not plan to delay the declaration of independence for much longer and is ready to “act at the end of this week or the beginning of next,” he said in an interview with the BBC on Tuesday. 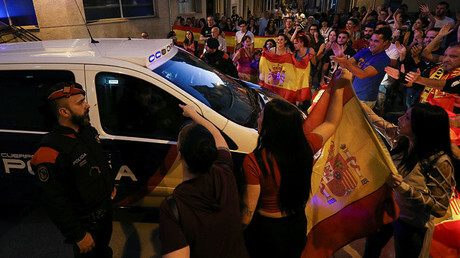 Spanish authorities continue to say they see the vote on Sunday as illegal and unconstitutional, while the EU gave its backing to the Spanish prime minister to resolve the crisis. The move has been criticized by the president of Serbia, who has accused the EU of double standards regarding Kosovo. Serbian President Aleksandar Vucic did not mince his words when he voiced a rather obvious question: "How did you proclaim the secession of Kosovo to be legal, even without a referendum, and how did 22 European Union countries legalize this secession, while destroying European law and the foundations of European law, on which the European policy and EU policy are based?" Marko Gasic, an international affairs commentator, said Kosovo's vote was recognized because it's not part of the union. "Some say the EU has double standards on this matter. I would say that they just have very low standards on this matter, in terms of international law and their consistency in obeying it. Because the EU opposes Catalan secession in Spain and it supports Kosovo secession in Serbia," Gasic told RT. 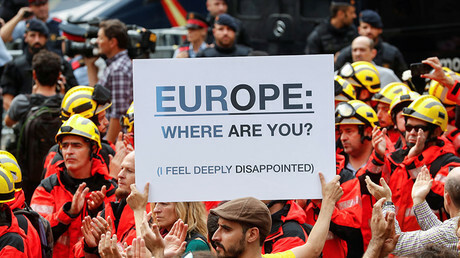 He added, "this is clearly a schizophrenic position the EU has." Gasic provided some historical insight into the EU's past stance on Kosovo secession. "While opposing the referendum in Spain, it was insisting and organizing referenda in Yugoslavia," he reminded. "In Yugoslavia they were saying that it didn’t matter what the constitution said; in Spain it is saying the constitution is all important. In Yugoslavia they said you have two weeks to decide whether you want independence for parts of Yugoslavia and we will decide within a week for you - this was in 1992." Gasic expressed doubt that the EU has learned any lessons from its past experience in Yugoslavia since "it never admitted any mistakes" there. "I believe the EU would behave in exactly the same way again because [Kosovo] is not an area that belongs to the club, the rich man’s club, as Spain does," he added. In the case of Yugoslavia and Kosovo, the EU is "deciding the fate of countries outside the European Union," because although it craves "stability in EU countries," it has no problem when it comes to "instability outside of the EU... because that gives the EU an excuse to project itself into those areas," Gasic argued. The political analyst went on to note that "if the EU wants to be consistent with international law, it should oppose secession in Spain, or in Serbia, or anywhere else in line with the terms of Helsinki Final Act and the UN Charter. Self-determination should be within nation states or rather within states, not without states." "The EU behaves selectively according to where its power interests lie. It is supporting Spain not because Spain is right, I believe Spain is, it is supporting Spain because it is convenient. And it was opposing Yugoslavia and opposing Serbia now because that is an opportunity for its projected power over there." "I think all Serbian see the comparison between Catalonia and Kosovo and Metohija. That is something that the Catalans themselves see. The Catalan government expects the EU to support its bid for independence because it is thinking 'if a drug-running, organ-harvesting criminal cabal in Kosovo can be allowed to separate from Serbia, then why shouldn’t we civilized Catalans have the same pleasure at the expense of Spain?" You could hardly blame the Catalans for seizing the opened Pandora box the EU is responsible for. It is a little bit late for the EU to remember international law now on its Western border when it was ignoring it on its Eastern border," Gasic told RT. This undermining of the nation state causes the "smaller parts getting irritated." Mallinson then drew parallels between what is now happening in Spain to past events when NATO opened a relentless offensive on Yugoslavia and the capital Belgrade over the question of Kosovo independence. "Why isn’t NATO bombing Madrid for 78 days, because the situation is similar in very many ways." “In fact, Kosovo is even more a part of Serbia than Catalonia [is to Spain.] Let’s remember in the Middle Ages joined when Ferdinand and Isabella joined all those bits of Spain together. Let’s remember that Spain is a united country but it is a conglomerate. We also must remember this dangerous knock-on effect. This is going to feed Basque anger more and more. And of course, other parts of Europe, possibly even the Walloons in Belgium, not to mention Scotland,” he continued. Mallinson suggested a possible solution to the ongoing crisis is to "throw out the hotheads and get Mr. Rajoy to talk to the leaders of Catalonia to try to come to some kind of temporary compromise while everyone gets together and try to put a stop to these deleterious effects of globalization and the destruction of the nation state." "Keep the interfering people out,” he emphasized.